Volterra is a charming town situated in the province of Pisa, not far from Florence, Siena and the coast as well. It is well known for its Etruscan origins and for the many remains belonging to this era. Today, Volterra is particularly renowned for its peculiar urban layout that reminds us of its Etruscan origins: people can still visit part of the majestic protective walls built during the 5th to 4th centuries BC - including the well-preserved Porta dell'Arco and Porta Diana, two gates for entering the city - as well as the Acropolis that houses several buildings and the foundations of two ancient temples. There are many Roman remains to visit as well, like the Roman Theater, dating back to the end of the first century AC, built in a natural amphiteatheater shape area. 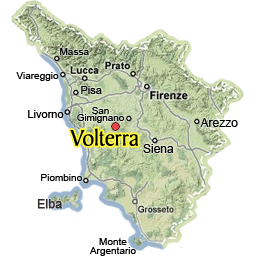 For more suggestions on what to see in Volterra, take a look at our top sights to see in in Volterra. Stroll down the historical center, step back in time and enjoy the timeless atmopsphere that surrounds the town: taste its typical products and visit the handicraft workshops, where you'll find many ideas for souvenirs from Tuscany, especially alabaster hand-made objects, which Volterra is famous worldwide for. Volterra is perfect for those seeking to visit a medieval hilltop town in Tuscany with charm and traces of history from its Etruscan, Roman and Medieval past. Not far from San Gimignano, the town merits an entire day or two of exploration to see the many wonderful sites preserved through time. Volterra is the city of alabaster par excellence: its tradition dates back to the Etruscans, the same as the city, that pays its tribute to this old tradition housing an Alabaster Museum, the eco-museum of Albaster, a charming place displaying over 300 works of art in alabaster stone, together with antiques and paintings. Whether you have a car or not, read this before coming to Volterra to know where to park or what train stations to use or buses you need to take to get to visit this charming medieval hilltop town. This farm just outside of Volterra offers the chance to lodge in one of its 4 spacious apartments and enjoy hiking natural reserves or playing on the sandy beaches nearby, visiting medieval Tuscan hilltop towns and relaxing in a tranquil and comfortable environment. Shared swimming pool, tastings of its products and wines and just enjoying the Tuscan countryside.